On Thursday November 16, 2017, V4T@Dakar kicked off at Guédiawaye HipHop. A word of welcome by Malal Talla (alias Fou Malade), Didier Lalaye (alias Croquemort) and Mirjam de Bruijn marked the beginning of a three-day festival, a joint effort of a diverse team: Guédiawaye HipHop, Africulturban, the Dutch Embassy in Senegal, IFAN, LARTES and Voice4Thought joined hands to facilitate an open dialogue. The audience present at the opening at Guédiawaye HipHop in the morning set the tone for the days to come: an enormously diverse audience came together to decipher ‘radicalisation’ in the Sahel region: what does radicalisation mean in our various societies? What are the challenges our societies face? What are our responsibilities as citizens and how can we contribute to positive (radical) change and provide alternatives to violence? 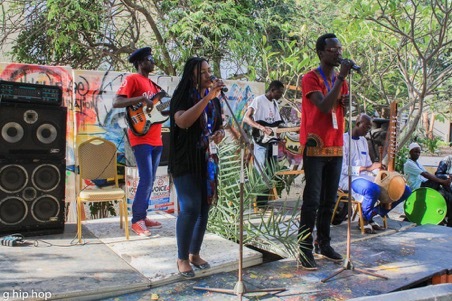 After the words of welcome and a further unifying activity of singing the Senegalese national anthem, the festival really took off with several groups starting their workshops of DJ-ing, photography and slam. 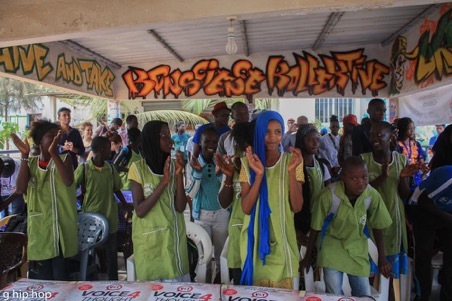 With the objective to ‘’write the neighbourhood’’ (écrire le quartier), small groups of youth partook in the exercise to describe their neighbourhood – its realities, challenges and opportunities – through these different creative forms. The outcomes of these various workshops will soon be shared on our website as well. In the afternoon, we gathered at the Théodore Monod museum / IFAN for the official opening of the festival with a panel discussion titled ‘’responsabilités des sociétés africaines face à la radicalisation’’ (responsibilities of African societies facing radicalisation). A large panel consisting of researchers, artists and activists Selly Bâ, Boukary Sangare, Fadel Barro, Nadio Kaina, Mouhamed Barro and Malal Talla (Fou Malade), shed their light on the issue in a discussion moderated by Dr. Massamba Guèye (Université Cheikh Anta Diop, Dakar). There seemed to be an agreement to the fact that a repressive, military response to radicalisation alone does not suffice to bring lasting, positive change to our societies. But how can we respond in lasting, positive ways? Or as Fadel Barro, initiator and coordinator of the movement Y’en a marre, put it: ‘’we have to create a new imaginary for Africa[…]so that people radically construct their societies, rather than deconstruct them.’’ Nadio Kaina, president of the citizen movement IYINA in Chad, emphasised the need to invest in youth, as youth from banlieues like Guédiawaye and Pikine, appear to be most vulnerable to radicalisation. This investment should be, according to Malal Talla, to provide employment to youth; alternatives to negative radicalisation. After the panel discussion, it was time for the presentation of the book to the Dutch ambassador Theo Peters. 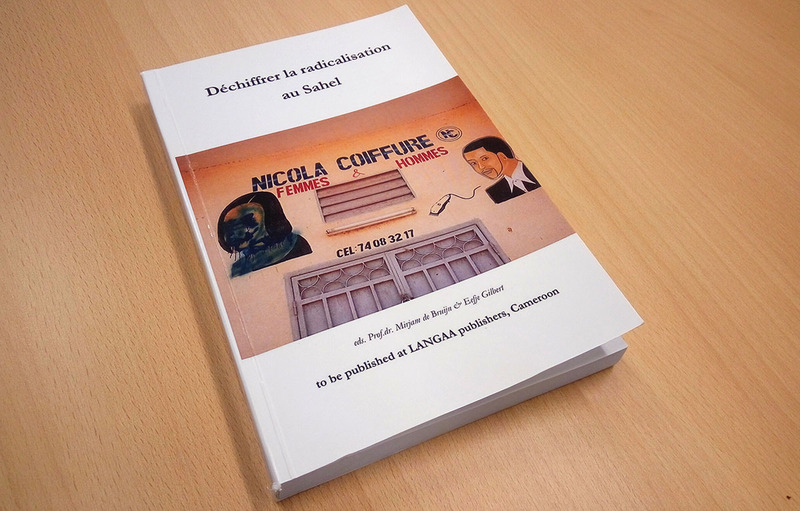 The book ‘deciphering radicalisation in the Sahel’, is a collection of twelve chapters by various authors with research experience on radicalisation in the Sahel. Compiled by Prof. dr. Mirjam de Bruijn and Eefje Gilbert, the book aims to unpack the concept ‘radicalisation’ that is, particularly in international policy circles, often equated to extremism, violence and jihadism. Through twelve itineraries of (de-)radicalisation in past and present, in various Sahelian countries as well as in the Netherlands, this book proves that radicalisation takes many different forms; a focus on past cases of radicalisation also help us understand that radicalisation can lead to lasting societal change as well. The book is on its way; the final version will include insights gathered during the festival. 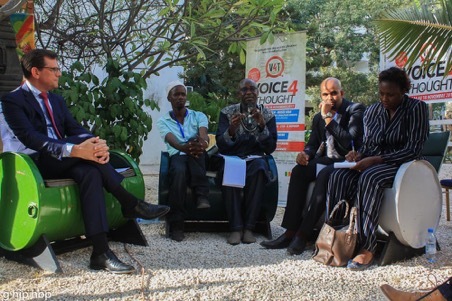 Photo, from left to right: Theo Peters (Dutch ambassador) and panelist Malal Talla, moderator Dr. Massamba Guèye, and panelists Dr. Boukary Sangare and Dr. Selly Bâ. 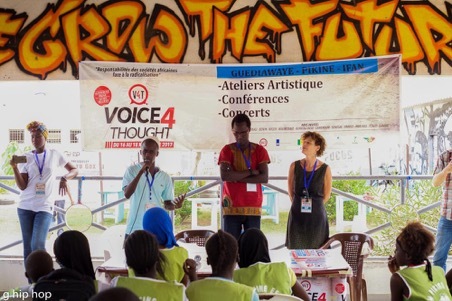 Master Soumy, rap artist from Mali, reminded us of the fact that we might want to consider music as a way to discuss societal issues with youth: ‘’Rap has power in Mali, it is the music the most listened to.’’ He followed his own reasoning and treated us to a brief performance. 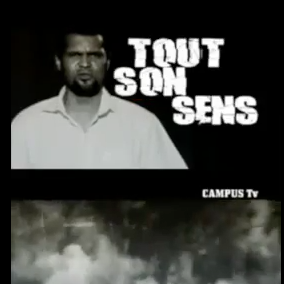 Croquemort (slam artist from Chad), supported by Amee (slam artist from Ivory Coast), followed his example with a performance of his ‘’les cieux ont brulé’’ (humanity on fire). To let settle the amount of information received from all the different panelists and artists, a refreshing drink and bite was offered, after which the programme continued with two film projections: ‘’La haine des autres’’, a film by Bokal on Boko Haram, and ‘’Sans espoir’’, a film by Sjoerd Sijsma in collaboration with researchers from the Connecting in Times of Duress research team. For those whose senses had not been triggered enough, an open mic was organised at Guédiawaye HipHop.